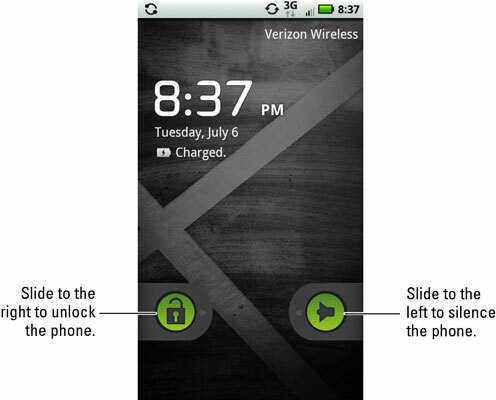 The Droid X phone’s volume controls are on the right side of the phone when it’s facing you. Press the top part of the Droid’s volume button to set the volume higher. Press the bottom part of the button to lower the volume. The volume controls work for whatever noise the phone is making at the time: When you’re on the phone, the volume controls set the level of the incoming phone call. When you’re listening to music or watching a video, the volume controls set that media volume. If it’s snoozing, wake up the phone. Obviously, if the phone is turned off, there’s no need to turn it on just to make it silent. But if your phone is snoozing, press the Power button to see the main screen. Slide the Silencer button to the left. You’ve muzzled your Droid. When the phone is silenced, the Ringer Is Silenced icon appears on the status bar. 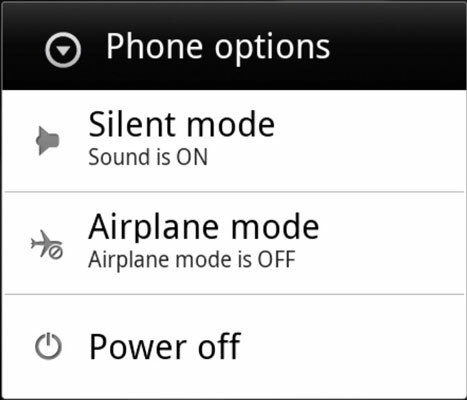 To make the phone noisy again, slide the Silencer button to the right. Press and hold the Power button until you see the Phone Options menu. From that menu, touch Silent Mode. Set the volume all the way down to zero. Press the Volume Down button one more time. The phone automatically enters Vibration mode. When the phone is in Vibration mode, the Vibration Mode status icon appears on the status bar.